I found myself all alone for lunch (hubby was away), and I had a couple dove given to me by a fellow hunter, Dave. I dug around the pantry for a quick glaze. 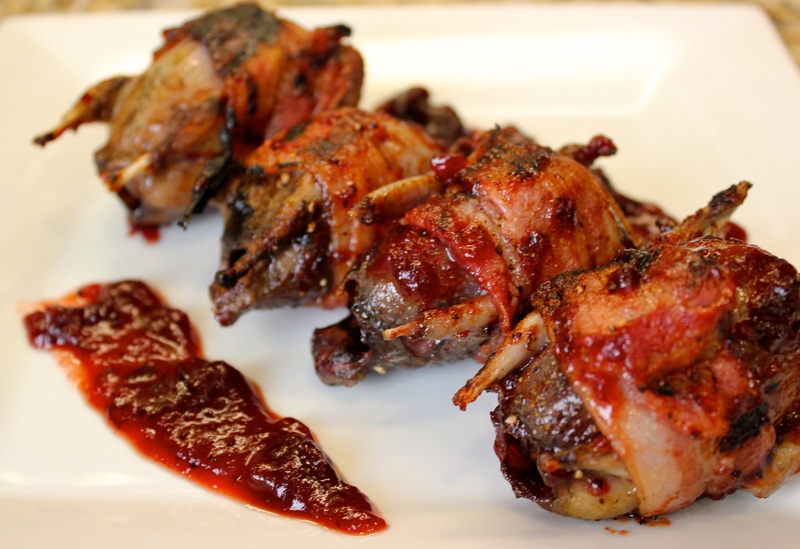 I had a few pieces of bacon left from a previous breakfast so I just wrapped those little birds up and tossed them on the grill with this quick glaze I threw together. You can substitute any kind of jelly, or marmalade for the cranberry sauce, and substitute sriracha for the chili sauce (but just use a little). With a quick raid of my pantry, I found a few ingredients to throw together to make a quick glaze to baste these tasty little birds. Salt birds with kosher salt and refrigerate, overnight or at least an hour ahead. Bring the birds to room temperature by pulling them from the fridge one hour ahead of cooking. In a small pot over medium heat, add the chili sauce, cranberry sauce, honey, cinnamon, and allspice, mix and heat through for a minute. Heat the grill to 400º. Wrap one piece of bacon around a bird and secure with a toothpick, if necessary. Once all the birds are wrapped with bacon, season with black pepper, and a little onion powder. Grill the birds, breast side down first for two minutes. Turn over and grill the other side, for 2 minutes. Turn off burners, and baste with the cranberry chili glaze, close the grill lid and continue to roast for an additional 3 minutes. If it’s too cold outside to grill, pre-heat the oven to 350ºF. Heat a cast iron pan (or oven safe pan) on medium-high heat. Add a few tablespoons canola oil. Add the dove and sear until brown on both sides. Baste the birds with the sauce and place in the oven to roast for an additional 5 minutes.